One of the most fascinating parts of working in a business that deals with the research and recovery of shipwrecks is the stories of the shipwrecks themselves. While many of the tales are tragic and horrible, they often tell of bravery and excitement. This is one of the things that draws people in right away to the world of treasure hunting. Aside from the promise of precious gems and gold and silver bars, many are captivated by the stories of long-ago explorers taking their wooden ships across the great blue ocean. There are countless, almost infinite amounts of stories and fables of ships perishing in the sea. Many have similar details, but every single one is different. There are some that are so unique that they are never once forgotten. This story is about one of those shipwrecks. The Royal Tar was a steamer ship constructed in 1835. 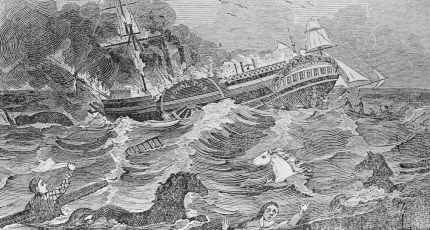 It is one of the most bizarre maritime disasters to date, namely because at the time of its final journey, it was carrying onboard members of a traveling circus, in addition to their menagerie of animals. This ship has been nicknamed “The Circus Ship” and is thought to perhaps be the inspiration (at least in part) for the best-selling novel The Life Of Pi. There has been a children’s book written about this shipwreck, also called The Circus Ship, though it has a happier ending than the actual wreck did. My father, Greg Brooks, learned of the Royal Tar shipwreck in the late 1990s. At that time, a man named Herbo Humphreys had plans to recover the wreck. He believed there to be an amount of silver onboard valued at around 10-20 million dollars. He wanted to team up with my dad and his company, but at that time money was tight for my family and they did not have the equipment necessary to help with the job. My dad still remembers the story of the Royal Tar, though, as one of the strangest wreck stories he has heard up to this day. The Royal Tar was a Canadian ship, with a home port of St. John, New Brunswick. On Friday, October 21st, 1836, the ship left port for the last time. It was carrying more passengers than normal on that day – an amount believed to be around 90. There were 21 crew members aboard and 70 men, women and children traveling to the United States. A portion of the travelers were with Fuller’s Caravan, a circus show that was touring at the time. Having completed shows in New Brunswick and Nova Scotia, the circus was going to perform in the USA. Their entire set of circus animals was onboard, including two horses, an elephant, two camels, and a number of other birds and creatures. There were large, elaborate structures onboard to house the animals, painted in bright colors and “caravan” style decor. To add to the surreality of the trip, there was also an entire wax museum display onboard with the circus, with wax figures of people and animals. To onlookers who watched the ship leave port, it looked a bit like Noah’s Ark. As the ship traveled southward, it hit some bad weather and gale-force winds. On the 25th, it was clear that something was not right in the boiler room. The engineer noticed the water level was too low in the boiler, which was perhaps the fault of the second engineer. The captain ordered the ship to anchor nearby at Fox Island, which is located in Penobscot Bay off the coast of Maine. Before the problem could be taken care of, a fire began. Despite efforts to extinguish the flames, it became clear that the steamer could not be salvaged. The ship was on fire in the middle, and it is said that the scene of chaos that ensued was quite dramatic, with people screaming and animals roaring in terror. There were only two lifeboats, capable of carrying only a third of the amount of people onboard. The Captain and a couple crew members began securing one lifeboat to fill with women and children, while a group of 16 men took the other lifeboat without orders and abandoned everyone onboard, rowing away to Isle Haut without so much as looking back. Meanwhile, many were perishing already in the flames, or throwing themselves to the sea to avoid the fire. Captain Reed remained calm and bravely managed to fill the lifeboat and prevent the death of several men and women. The animals were freed in an effort to allow them to save themselves. The camels and horses were pushed overboard and the elephant jumped, breaking several planks and ladders in the water, which some people were using to stay afloat. Unfortunately, those people did not survive, and the elephant never made it to shore. The only animals to live were the two horses, who made it to the island. The flames were seen by the nearby US ship Veto. It reached the scene a half an hour later, and Captain Reed was able to use the lifeboat to usher groups of survivors to safety. With his and his crew members’ courage, they were able to save the lives of 40 men, women and children. It is believed that four men, nine women and ten children perished that night, in addition to the animals. It is possible that some of these deaths could have been avoided if the second lifeboat had remained behind. This shipwreck is one of the most memorable stories I have ever heard. It is unusual and tragic, and happened very close to my home in Portland. There are many famous wrecks that we hear about, but I think it’s important to keep the memory of those who perished in less known wrecks alive.